Disclaimer: I received this item in exchange for review. All opinions are my own. Happy Wednesday! We’ve been back over a week and I still have so much to share from our trip! I hope you were able to catch our trip recap and read all about it. Today, I want to talk about boardwalk style! 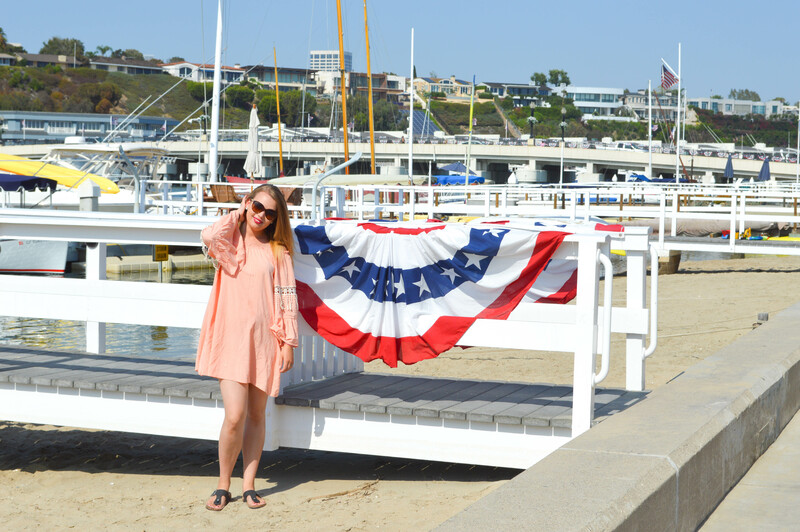 There’s definitely a type of fashion that is reserved solely for summer and the beach. It happens to be my favorite kind. I am always on the hunt for the perfect summer pieces and I think I found them at Ruby Claire Boutique. I am in love with this dress. Actually, I’m in love with everything they have but this dress really caught my attention while I was browsing the site. It was before our trip to Balboa and I knew I just had to have it to bring with me because it was perfect for the boardwalk! This dress is so gorgeous and unique. It my favorite color (pink!) and the tassels make it so fun. The off the shoulder (or, cold-shoulder) look is so in right now and I loved it! This dress is perfect for a day in the sun, a summer date night, or even a swimsuit cover up! You can style it so many ways! I chose to pair it with some simple sandals, pandora wrap bracelets, and my hair pushed back. I loved the way this looked and got so many compliments! Everyone loved this dress and you will too! Ruby Claire Boutique has something for everyone. Tops, bottoms, skirts, dresses, accessories, shoes, you name it, you’ll want everything! Ruby Claire Boutique is beautiful, feminine, and classy. Oh, and they have an awesome sale section you won’t want to miss! Want to shop Ruby Claire Boutique? Use code “LOVELY20” at checkout for 20% off your order! Whats your favorite summer trend? i love the color of that dress and it looks amazing on you! This dress looks so cute and comfy, girl! Love the dress! Such a perfect color and looks so good on you!